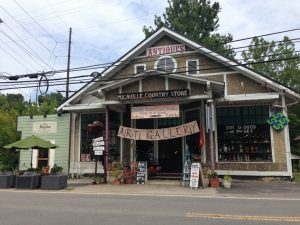 One of a Kind Art Gallery celebrates Appalachian Artists & Craftspeople. Come experience shopping in the nostalgic Old Micaville Country Store. We now display more than 100 of our region’s finest artists! We are located at the crossroads of NC 80 S and the Micaville Loop, 15 miles north of the Blue Ridge Parkway, 4 miles east of Burnsville and 10 miles west of Spruce Pine. Hours are: Mon-Sat 10a-5:30pm, Sunday Noon-5pm. Saturday Morning Music Jam 10am to noon.